Highly desirable, luxury 2-bed air-conditioned apartment (built 2008) with modern furnishings and contemporary feel. The communal pools, children's playground and barbecue area make it a perfect resort for the family holiday. The pools are gated for children’s safety and protection. The apartment has a private balcony overlooking Vale of Parra. The lounge contains a 2-seater leather settee and 2-seater sofa bed, LCD TV, DVD player and DVDs. The bedrooms comprise a double and 2 single beds, with built-in wardrobes, one being en suite. There is secure parking for one car in the underground parking. 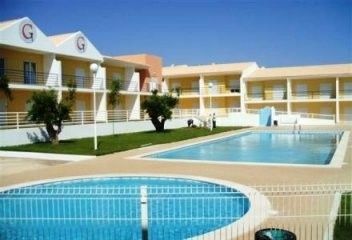 The apartment is minutes away from Guia’s popular beaches, and a 10 minute car ride from the famous Algarve Shopping Centre and adjacent Designer Outlets. Other nearby attractions include Zoomarine, and Aqualand waterpark just a short drive from the apartment. A free Meet-and-Greet service is available, and if required, transport can be booked to take you direct to and from the apartment. We have been travelling to the Algarve for 30 years, and so when an opportunity came to purchase an apartment near the sea and shops I jumped at the chance! It has proved a super investment and not only do we rent it out but use it ourselves several times a year. We successfully applied for a Portuguese Property Rental licence which was awarded in February 2016, and details of which can be seen inside the apartment The licence number is 25044/AL. Not quite luxury. Construction work in the complex. Is is advertised as a luxury 2 bedroom apartment. This is why I think it isn't luxury. - Only 3 of the 4 rings on the hob worked. - The one external shutter, did not go fully up, so every time you went to the balcony, you had to duck. - a great pool, though it was a little cold in October. The apartment was a little noisy, as it is near a busy road junction, but most of the noise came from the complex itself as there was construction work going on for 5 days out of our 7 night stay (they only stopped at the weekend). Jack-hammers were going off from 8AM to 5PM most days. I do realise that this work had to be done, but I am sure they would have given the owners plenty of notice and we should have been informed before we travelled, NOT when we arrived. I am certain that I would have given it a higher rating, if the construction work wasn't happening, but from the state the site was in when we left (18/10/18), I would say there is another couple of weeks work, but maybe less noisy. We still had a great holiday, but it could have been so much better. The road nearby has become much busier since our last visit to this complex and is quite noisy, otherwise we would have given 5 stars. Nice two bedroom apartment with plenty of room for four adults. Everything you needed for a holiday in the sun, great pool area with plenty of sun beds, local bars, cafes and restaurants all within a few minutes walking distance. The property was just what we were hoping for. Having stayed in this area on a number of occasions we had a good idea what we were looking for and this property fitted the bill perfectly for the 5 of us. On the plus side, location, underground car parking facilities, proximity to the pool and play area, proximity to other amenities including shops and restaurants, good size apartment. A number of things in the apartment weren’t working as they should: extractor fan in kitchen; safety deposit box; one of the shutters over the doors; bidet. Little things really that didn’t have a major impact but nevertheless were not as they should have been. The property also lacked some basic cleaning and kitchen apparatus. Overall the holiday was really enjoyable and we’d certainly consider this place again. The complex itself tended to be quiet in the morning and very busy some afternoons. The pool security may as well not have been there as others than stopping toddlers from using inflatables didn’t enforce any of the other so called rules including drinking, smoking and loud music. Air con is superb and was much needed when a heatwave up to 39 occurred and kept our kids nice and cool. The apartment is very well equipped and secure with shutters, the kids part is seconds away as are both pools which are very well kept. Supermarket is ten mins walk as is more bars and restaurants. We walked with our kids (in buggies) from here to gale beach many nights which was stunning. Derek is an absolutely wonderful host and the transfer company he arranged for us was also absolutely perfect. We will return!